Doha-Qatar, October 07, 2018: With the objective of enhancing bilateral trade relations between Qatar and Turkey, a business delegation headed by the Deputy Chief Executive Officer of Al Meera Consumer Goods Company Eng. Salah Al Hammadi met with Istanbul and Samsun based investors and businesses looking to expand in Qatar. Meetings also occurred with government officials including the Governor of Samsun Mr. Osman Kaymak. On the first day of their two-day official trip, Al Meera officials visited Happy Center where they met its Chairman Mr. Ismail Altun and Chief Executive Officer Mr. Yavuz Altun and discussed strategic partnership and ways to improve mutual cooperation. Following this, Eng. Salah Al Hammadi graced the opening ceremony of Happy Center’s 135th outlet. Next on the visit list was a trip to the Chamber of Commerce of Istanbul, the 3rd largest chamber in the world, which has about 420.000 members. Here, the Al Meera delegation was welcomed by the Vice Chairman of Chamber of Commerce of Istanbul Mr. Ahmet Uzair. During the meeting, the two sides discussed the possibilities to developing a solid network of partners in Turkey, based on the recommendation of the Chamber of Commerce. Furthermore, Al Meera has signed MOU with Tekzen, a Turkish Corporation and part of Tekfen Group, to import non-food products. This collaboration will enable Al Meera to increase its non-food offerings to the Qatar Market. 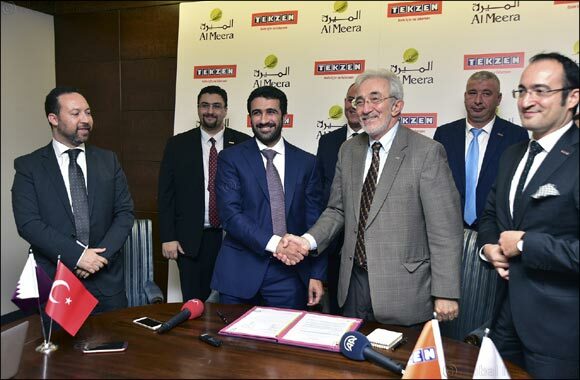 The MOU was signed during a meeting between Al Meera’s delegation and the Chairman of Tekzen, Mr. Murat Gigin and Mr. Onur Mertoglu, Board Member and General Manager of the company. On the second day, the Al Meera delegation visited Samsun Governorship to take a tour around Koytour Chicken factory to assess the quality standards of their exclusive partner, with its General Manager Mr. Yahiya Nafi. During the visit to Samsun, the Al Meera delegation met with the Governor of Samsun Mr. Osman Kaymak and discussed how his region could support trade with Al Meera. In addition to this, the delegation also met at the Chamber Of Commerce of Samsun, Mr. Salih Zaki Murzioglu, Vice Chairman of the Union of Chambers of Commerce of Turkey and Mr. Sinan Chakir, Chairman of Samsun Chamber of Commerce and Stock Exchange. The visit was widely covered by local Turkish newspapers. Qatar and Turkey have always had strategic relations in many areas of cooperation, built upon a strong and friendly historical relationship. Trade relations continue to increase; in the first quarter of 2018. There are about 186 Turkish-Qatari firms operating in Qatar market and 19 firms with 100% Turkish capital. Since its inception, Al Meera has placed immense thrust on community welfare, as social responsibility is considered an integral part of its programs. In lieu to its ongoing efforts, Al Meera Consumer Goods Company QSC, was recently recognized to bring forth a number of economic initiatives designed to empower entrepreneurs in the country and contribute to Qatar’s economic diversification during the 5thSocial Responsibility Conference. Al Meera was honored for its efforts to support startups and entrepreneurs by launching the “National Product” initiative, in collaboration with Bedaya Center and the Ministry of Economy and Commerce (MEC). Under this initiative, local producers and startups in the food industry were offered with prominent shelf space at its Gulf Mall shopping center, thereby providing entrepreneurs in the country with a premium platform to introduce their products to the market and sell them to consumers.